We print for a lot of indie bands but every now and then we find ourselves printing for one of the greats. 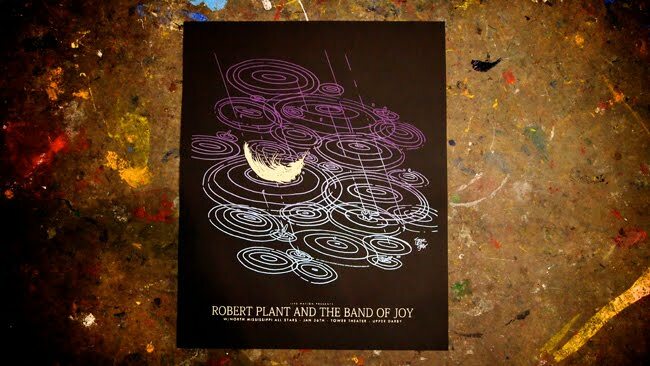 The latest poster produced and printed by ABNRML.com is for the one and only Robert Plant. For this very special print we enlisted the help of ABNRML poster partners T-Bone & Aljax to whip up a last minute special design. This print is for Robert Plant and The Band Of Joy and his sold out intimate performance at The Tower in Upper Darby, PA. This poster was printed on black 19"X25" French Paper cover stock that was cut down by hand to 19"X23". One of the color layers used a color bleed / fountain technique which allowed us to screen a blend of purple and blue with one pull of the screen. It was an amazing technique I'm sure we'll use again with future prints. This poster was an extremely limited edition and an exclusive print for Live Nation.